Errol Leslie Thomson Flynn (June 20, 1909 – October 14, 1959) was an Australian film actor, writer, producer, and director. He became most famous for his romantic swashbuckler roles in Hollywood films and his flamboyant lifestyle. He is remembered as one of Hollywood's legendary figures, with leading roles in more than 60 movies during his short 50 years of life. Flynn brought entertainment to millions of movie goers with his devil–may–care and derring do on–screen adventures. Like many others before and after him, he blurred the lines between on screen and off screen personae. Few did that as well as Errol Flynn. Flynn was born in Hobart, Tasmania, to Marelle Young and Theodore Thomas Flynn. His family moved to Sydney, New South Wales, when Flynn was a young child. Here he met his first love, the ocean. His father, Theodore Thomson Flynn, was a biologist and a professor at the Queen's University of Belfast in Northern Ireland for the latter part of his career. Flynn was a very athletic person However, he did not excel at his studies. He was expelled from two private schools for fighting. When he was 20 years old, he moved to New Guinea, where he bought a tobacco plantation. Unfortunately the business failed. His next attempt at business, a copper mining venture in the hills near the Laloki Valley near Port Moresby, also failed. In the early 1930s, Flynn left for Great Britain and got an acting job with the Northampton Repertory Company, where he worked for seven months. There, he starred in the American film In the Wake of the Bounty, directed by Charles Chucker in 1933. According to Gerry Connelly's biography Errol Flynn in Northampton, Flynn also performed at the 1934 Malvern Festival, in Glasgow, and in London's West End. He was discovered by a Warner Bros. executive, signed to a contract, and shipped to America as a contract actor. In 1942, he became a naturalized citizen of the United States. Flynn became an overnight sensation with his first starring role, Captain Blood, in 1935. He became typecast as a swashbuckler and made a host of such films, including The Adventures of Robin Hood (1938), The Dawn Patrol (1938) with his close friend David Niven, Dodge City (1939), The Sea Hawk (1940), and Adventures of Don Juan (1948). Flynn played opposite Olivia de Havilland in eight films, including Captain Blood, The Charge of the Light Brigade (1936), The Adventures of Robin Hood, Dodge City, Santa Fe Trail (1940), and They Died with their Boots On (1941). The Adventures of Robin Hood was Flynn's first film in Technicolor. 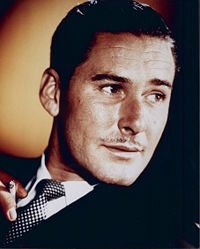 Errol Flynn as Capt. Nelson in Operation Burma! During the shooting of The Private Lives of Elizabeth and Essex (1939), Flynn and co-star Bette Davis had some legendary off-screen fights, with Davis striking him harder than necessary while filming a scene. Their relationship was always strained, but Warner Brothers teamed them up twice. Their off-screen relationship was later reconciled. A contract was even presented to lend them out as Rhett Butler and Scarlett O'Hara in Gone with the Wind but the teaming failed to materialize. Flynn won acclaim as a drunken ne'er-do-well in The Sun Also Rises (1957). His colorful autobiography, My Wicked, Wicked Ways, was published just months after his death and contains humorous anecdotes about Hollywood. Flynn wanted to call the book In Like Me, but the publisher refused. In 1984, CBS produced a television mini-series based on Flynn's autobiography, starring Duncan Regehr as Flynn. In the 1950s, Flynn tried his hand as a novelist, penning the adventure novel Showdown, which was published in 1952. Flynn was married three times, to actress Lili Damita from 1935 until 1942 (one son, Sean Flynn); to Nora Eddington from 1943 until 1948 (two daughters, Deirdre and Rory); and to actress Patrice Wymore from 1950 until his death (one daughter, Arnella Roma). In Hollywood, he tended to refer to himself as Irish rather than Australian. Flynn lived with Wymore in Port Antonio, Jamaica, in the 1950s. He was largely responsible for developing tourism to this area, and for a while owned the Titchfield Hotel, decorated by the artist Olga Lehmann, and popularized trips down rivers on bamboo rafts. Flynn decided to leave California in 1952, after purchasing a yacht named Zaca with his third wife. He had become bored with Hollywood and felt he was not being offered promising roles. Flynn stated that being on the ocean made him feel comfortable and at home. In his later years, he started writing. While at a friend's house in Vancouver, British Columbia, Flynn suffered a heart attack and died on October 14, 1959. He is interred in Forest Lawn cemetery in Glendale, California. This page was last modified on 16 August 2017, at 15:09.